One of the most fundamental elements of any company’s style guidelines, a good basic system of fonts and usage will help you build brand equity, leave a lasting impression, and appear consitent and professional regardless of industry. From print ads to dynamic websites, type is everywhere and it’s important. 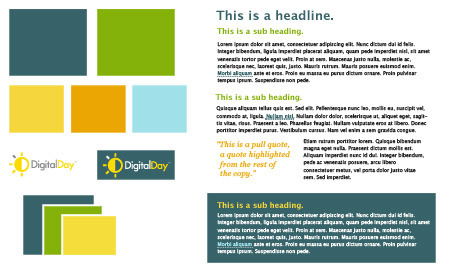 To that end, we’ve established a simple, but versatile type system we can use for all DigitalDay materials. Our logo font is (a slightly tweaked) Futura, and that works well for headlines and pieces where it can be a title or section title. It does not lend itself to readability in large blocks of copy though, which brings us to our secondary font choice. Avenir is a mix between a truly gothic/modernist style like Futura, and a more contemporary sans serif. It is easier to read in multiple sections of copy (like this one), so we use it to accompany Futura in print oriented pieces. For the web (which is all we do), we obviously need to use different fonts for browsers and compatibility. Our main web font is Lucida Grande / Lucida Sans. It is clear and clean, and we use it for copy and web-safe headlines. It’s a little more unique than Arial or Verdana, but is widely compatible when correctly specified. Our accent font, used much more sparingly, is Georgia. Arguably the most attractive web safe font, its serifs and ornate style are a great contrast to the simple shapes of Lucida. When used together (and per guidelines, a separate post), these fonts give off the sort of impression we’re looking for. Fun, but professional and fresh but still clear and easy to understand. Whether your intent is simple and minimalistic or ornate and lavish, set some basic typeface guidelines early on, and all of your designs and marketing pieces will benefit. It’s tough work, but someone’s got to do it. I’m talking about the Transworld Advertising Association (TAAN) Meeting I had to attend last week in Laguna Beach, California. 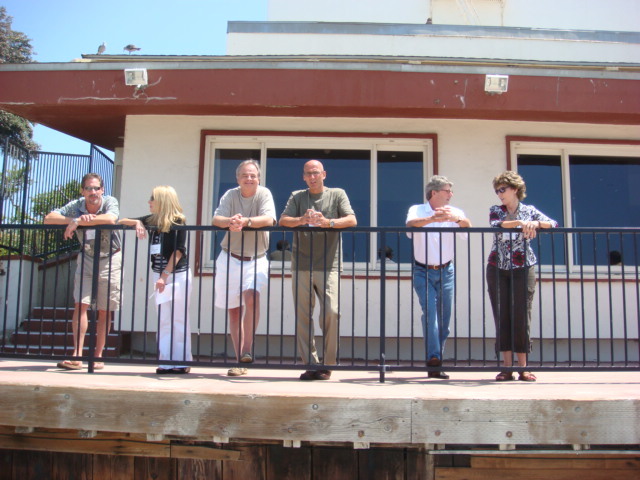 The four day meeting took place at the Hotel Laguna On the Beach, a vintage beach-style hotel. Upon checking in and going to my room, I was a little concerned when I couldn’t find the air-conditioning controls. Turns out the AC consisted of two large windows that opened to let in the ocean breeze and the sound of the waves hitting the shore. It was perfect for sleeping. 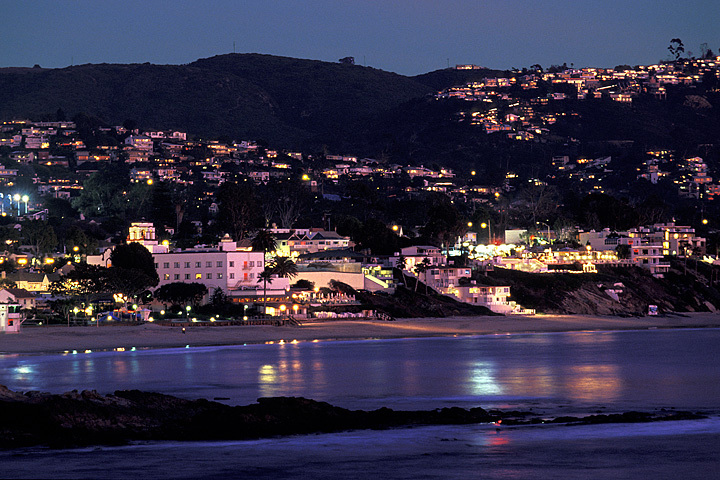 Laguna Beach in the early evening with a view of the hotel where the TAAN meeting was held. Protecting Your Most Important Asset — The Agency’s Talent, presented by Mike Carlton of Carlton Associates. Mike is an ad agency veteran whose career was actually started in Cleveland where he was a founding member of Carr-Liggett, one of the area’s largest ad agencies in the ‘80s. Mike explained how to best structure a creative agency and how to nurture talent within an agency, concepts we’ll try to implement here at DigitalDay. Mike Carlton of Carlton Associates from Chagrin Falls, Ohio, explains the value of mentoring within an agency. Win-Win Negotiations presented by Scott Potter of Baker Communications. 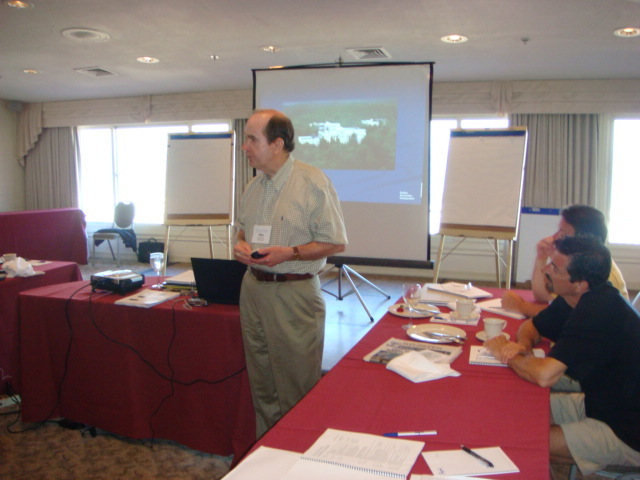 Scott’s workshop outlined the types of negotiation tactics clients often use and how to counter or address those tactics. Using Social Networking as a Marketing Tool presented by Jason Kang of MySpace. This was one of the most interesting and informative sessions for me. I learned that MySpace is not just a teenager hang out but can be effective in reaching and targeting large numbers of older and professional demographics. I’ve already had a follow-up call to brainstorm possible programs with some of our agency’s clients. The social parts of the meeting included wonderful dinners, cocktails and conversation, and an afternoon of golf at Pelican Hill Golf Resort, the most impressive course I’ve ever played. 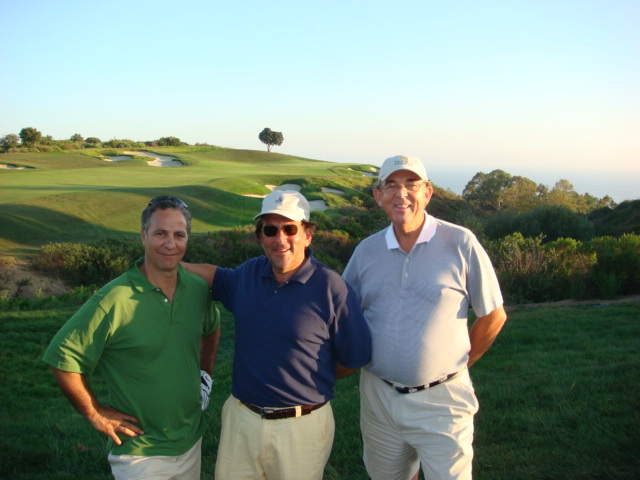 Mark Vitullo, Bob Neville and Maike Gallagher take a break on the back nine of Pelican Hill Golf Club. It was a great meeting but now I’ve got to decide if I should force myself to go to the next meeting in Reykjavik. 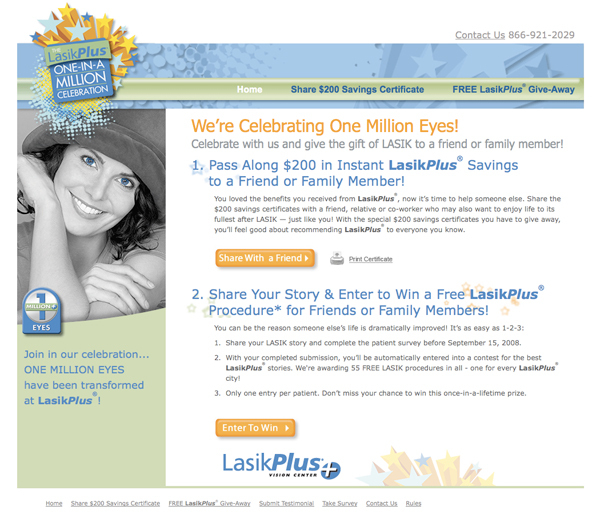 LasikPlus, the largest provider of LASIK eye care in the US recently performed its one millionth procedure and DigitalDay helped them get the word out by developing the LasikPlus One-in-a-Million Celebration. This online promotion with its enter to win component, was backed by targeted email campaigns, banner advertising and PPC programs. If you can remember the last time we talked about it, you’ll remember that the Web is moving to, well, people’s pockets. As more and more smart phones become capable of accessing the web, new design issues arise. How do you design a site for a screen with a screen resolution smaller than the eight-year-old 800×600 standard? The answer is very delicately. It starts with your audience. Who are you trying to reach? Understanding who they are and what they’re looking for is the first step you need to take. As this guy weighs in, there are three types of mobile web user: the casual surfer, the repeat visitor, and the “urgent, now!” visitor. 1. The casual surfer is looking for nothing in particular. Perhaps he’s playing with his iPhone waiting in the drive-through line, or she’s browsing on her Blackberry before her flight takes off. The point is that no one is that it’s an informal and short site visit—the information should be organized clearly and effectively or the visitor will leave. 2. The repeat visitor is seeking new content. Regular updates will keep this type of user more interested and involved in checking your mobile site. 3. The third kind of visitor is looking for information and they want it ASAP. If your information isn’t properly organized, they’ll simply find a better way to find what they’re looking for. It is critical you’re your site is easier to navigate than the sites of your competitors. Once you’ve planned your site, it’s time for design. It’s best to keep it simple—the mobile Best Buy web site, for example, has just two search fields: one to help find a product and one to find the closest store. When designing for the online web, less is most certainly more. Ultimately, your design is for your audience and not your portfolio. It is important to remember that in mobile web design form follows function. If your potential customers can’t easily navigate your site they’ll leave to find a site that will work for them. After establishing our logo, we needed to take a look at an overall color palette we could use. A company’s color palette is one of the more interesting pieces of the identity. It can be a little abstract (using colors to symbolize aspects of the company), but is still very tangible (its usage can be seen and identified right away). Your palette typically consists of one or two main colors, and several tertiary, or accent colors. The goal is to create a versatile, but unique set of colors that will serve you in a variety of usage situations, while always retaining that special brand feel. Approaching a color palette in house means you have to consider input from all angles, but it’s important there’s a single, firm voice that makes the final decisions. While there are objective meaning and connotation to certain colors, this piece of the identity is fairly subjective, so opinions will be varied. Here’s what DigitalDay is using as our color palette, it’s a nod to marketing pieces we’ve had in the past, but has a fresh, clean look, and enough variety that it should serve us well for some time to come. Choosing colors for their meaning is a huge subject, but it’s important that you consider what image you want your brand to project, and what each color says about you. If you’re in a field where strength and stability are important, you’re probably going for a richer, more traditional set of colors than a spunky new startup. Warm, rich earth tones might work great for your organic food business, but those same colors used with a medical consulting firm will give a dirty or messy look that doesn’t fit the market at all. Consider your audience’s culture as well, in certain cultures specific colors or combinations can have a negative or even offensive connotation, so it should be treated sparingly if you work with these audiences. Lastly, consider the overall context of your brand and its business. You might like red for the attention and emotion it conveys, but if you operate a funeral home, red can also symbolize blood or wounds, and could be very off putting for your customers, given the situation which brings them to you. As you can see, an effective way to present palettes (inside the company and beyond) is with some sample usage and options. It’s difficult to visualize how the colors will work when just looking at boxes. An effective color palette will guide your marketing communications, ensure consistency, and help align everything you do with your brand. With a little twist on some social networking we’re sharing our colors with you, here’s our palette on ColourLovers and Adobe Kuler. Enjoy! To commemorate the move to our new office, we launched the new DigitalDay website this past Friday, putting to bed our previous one page website experiment. Two weeks ago I received the kind of email I dread: My brother asked if we could help his brother-in-law with the design and development of a political website. After doing a little digging, my fears were confirmed — there would be little to no money to do this and no content to work with. The site would be for Bill Conte, a Republican candidate for Summit County, Ohio’s Fiscal Officer. This is a local race in a city that is 85% Democrat against an entrenched incumbent who’s held the office for more than 20 years. The phrase “snowball’s chance . . . “ quickly popped into my head. Surveying other local, county and state level political websites, we quickly saw how badly most of them are done — poor design, no organic optimization and just plain boring. At the very least, we figured we could have a little fun with design, do something different and maybe benefit from a little networking. Being a push-over, I agreed with the stipulation that we would have total control of the strategy and creative. To help prime the search engine pump, we immediately launched a coming soon, organically optimized, place-holder site. Yesterday, we launched www.BillConte.com, a simple political website that leverages social media as much as possible. We created and embedded Flickr, Linked In, and My Space accounts to help spread the Conte word through social networking, create link-backs to the website and pump up organic search. We seeded YouTube with a couple simple videos. Finally, we created a WordPress blog as a content management tool and embedded it into the site. Two weeks ago, if you did a Google search for “Bill Conte” or “William Conte”, our guy had no results. Today, he’s on the first page at number 1 and 8, respectively. For the much more competitive term “Summit County Fiscal Officer”, the YouTube video ranks number 6. Pretty good results in just two weeks. Now it’s up to Bill to work the social media and keep this snowball from melting too soon. It will be interesting to see what happens in November.